CAPE CANAVERAL, Florida -- Imaginary space exploration just got a little be more crowded for Buzz Lightyear. That's because Mattel has introduced a "MARS EXPLORER" doll as part of its BARBIE® I CAN BE…™ collection in collaboration with NASA. 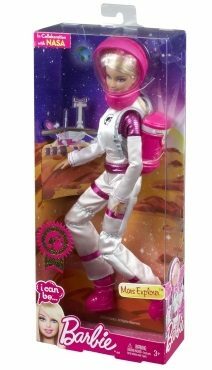 According to Mattel's description of the space doll, "Barbie I Can Be… dolls and accessories let girls play out different roles and "try on" fabulous careers, including astronaut. Always a pioneer, Barbie doll is ready for her thrilling mission to Mars in a stylish and functional suit — sure to dazzle any alien life form she encounters!" Launched by Mattel in 2010, the BARBIE® I CAN BE…™ collection is touted as a global campaign to inspire girls "to dream, discover and explore a world without limits." "For more than 50 years Barbie has served as a reflection of fashion, culture and aspiration to girls of all ages. Barbie inspires girls to try on different careers, encouraging them to play out their dreams and explore the world and all of its possibilities," said Stephanie Cota, Senior Vice President, Barbie Marketing about the collection launch in 2010. "We believe role-playing with Barbie leads to real life opportunities and are very proud to partner with organizations who continue to inspire girls and women with the belief and confidence that they can do anything."